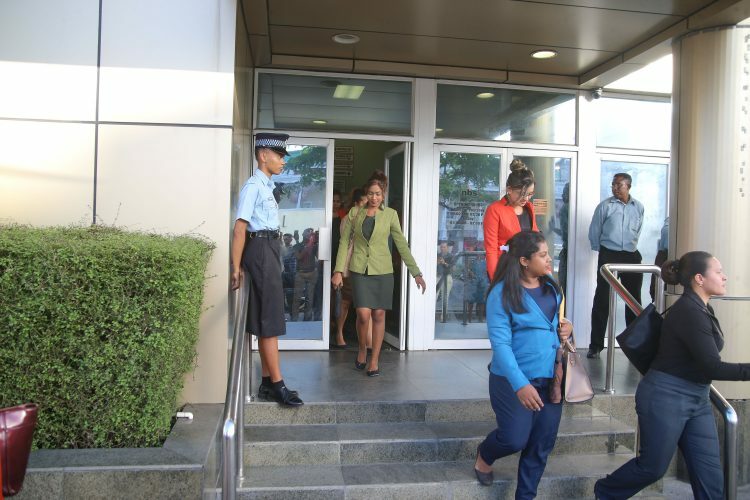 Finally honouring a court decision, the New Building Society (NBS) yesterday afternoon wrote a $59,033,000 cheque to former manager Maurice Arjoon for pension owed, after his lawyers attempted to levy on the assets of the bank, which then locked the doors of its Avenue of the Republic headquarters with customers and others inside. By last evening, NBS managers, whom it is believed had given the order to lock the doors, were whisked away in police vehicles to be further questioned on concerns of initially holding customers, who would have completed their transactions in the bank, against their will. One of Arjoon’s attorneys, a police officer and a court marshal were also among those locked in. Arjoon’s legal team swooped down on the financial institution a little before lunch to levy on its assets after its failure to honour the court’s December 20th, 2017 judgment in the favour of Arjoon, who had been sacked by NBS a little over a decade ago. 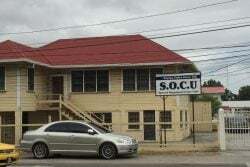 Sanjeev Datadin, lead attorney for Arjoon, turned up at the bank with the police and court marshal in tow to execute the levy but managed only to remove one of the bank’s vehicles from the premises. The operation was immediately hindered as the bank became aware of what was happening and locked its doors, initially preventing customers from exiting or entering the facility. 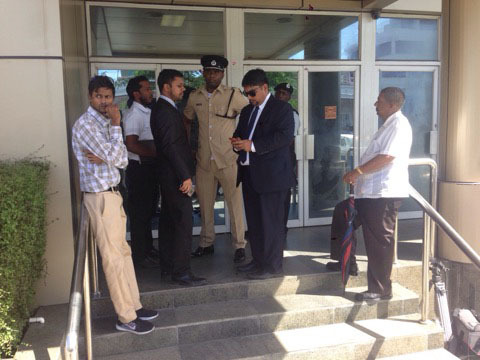 One of Arjoon’s attorneys, Ganesh Hira, along with the police and marshal who had gone to execute the levy, were among the persons locked inside the bank and denied exit. Vanloads of police officers, headed by Deputy ‘A’ Division Commander Wendell Blanhum, who arrived shortly after, were also denied entry. Responding to questions from reporters about the welfare of the customers inside the bank, Blanhum said that the matter was being looked at. He noted at that point that talks were being held with the bank’s attorneys and expressed the hope that “good sense” prevail to have the matter resolved. Some three hours after the initial closure of the doors, Blanhum and his officers were allowed into the bank, along with both the bank’s lawyers and the remainder of Arjoon’s legal team. At about 4.30 pm, some four hours after the doors had been locked, employees, some visibly embarrassed by the entire episode, began filing out of the bank, one after the other. 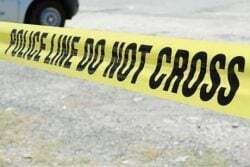 That was after they reportedly provided statements to the police on what had transpired inside during the stand-off period when no one was allowed to either enter or exit. In an apparent bid to avoid further embarrassment and the public spectacle which by that time was created by the scores of curious onlookers who had gathered, the bank had covertly allowed customers out through its back gate. Datadin had made it clear that the levy exercise could not be interfered with and would continue to be enforced if the bank refused to pay the money which was awarded to his client by the court. He explained to this newspaper that the police could have arrested any person who got in the way of the levy proceedings. 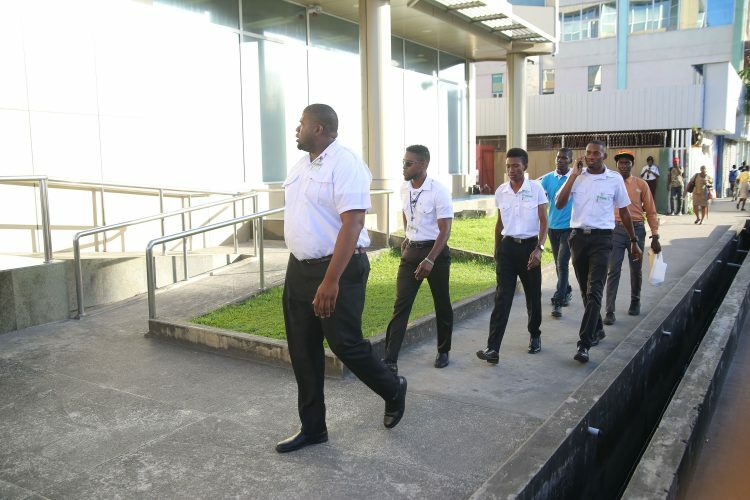 After the cheque was made out to his client, Datadin indicated that the levy proceedings would not be stayed until it has been actually cashed. Though attorney for the bank Pauline Chase had argued that the levy proceedings “ought not” to have been brought, since there is a pending appeal of the judgment awarded to Arjoon, Datadin was resolute in his position that the appeal in no way hindered the execution of the levy. He stressed that the levy was being exercised to recoup the pension awarded to his client, pursuant to the Court of Appeal judgment that Arjoon was entitled to be paid his pension. 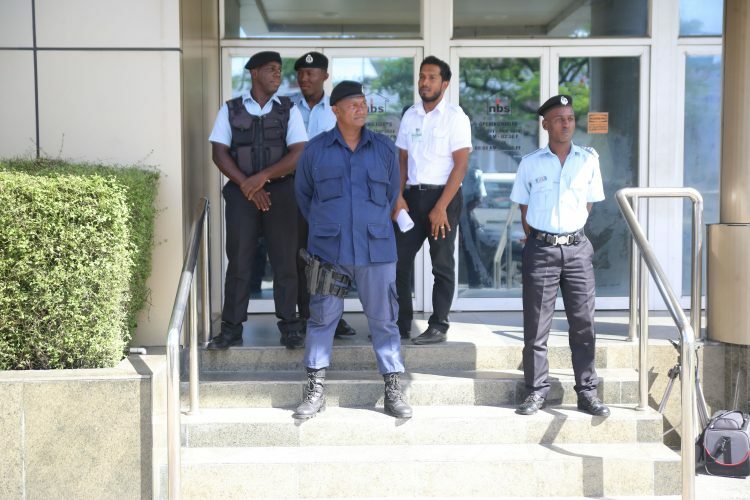 Apart from its managers, the bank’s two security guards, who locked the doors, and the security who guarded the back gate were also taken into police custody. They braved the sweltering afternoon sun to stand in solidarity with Arjoon. 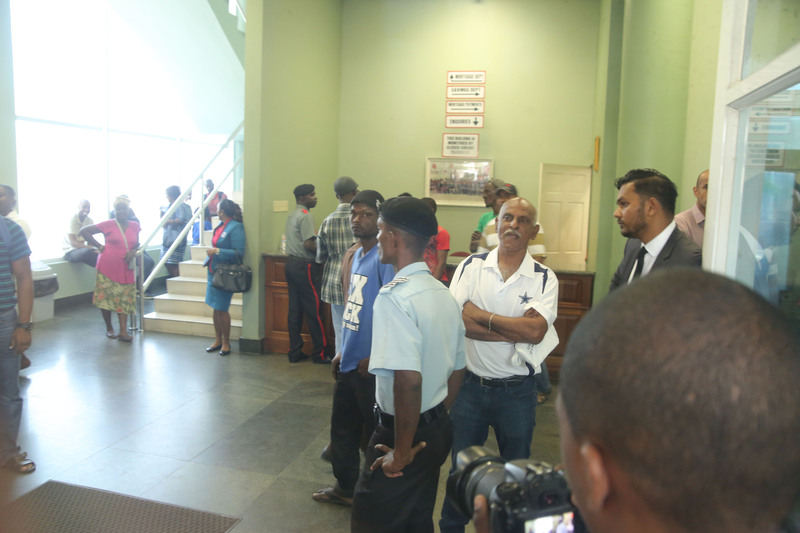 Protesting the bank’s refusal to pay, many onlookers voiced their opinions, arguing that it was unfair for Arjoon to be owed, while noting that if a customer were to do the same, the bank would take quick action to recover whatever sum was owed to it. 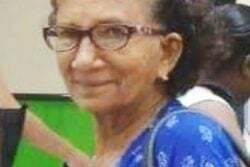 Arjoon’s daughter, who was present and had been also locked inside the bank, expressed disappointment with the bank’s action, while noting that her parents and family have gone through quite a lot for more than a decade. She said that while the cheque had been written, it was merely a “small victory” in a legal battle which she noted will likely continue as the NBS has already filed an appeal of the award of pension to her father. 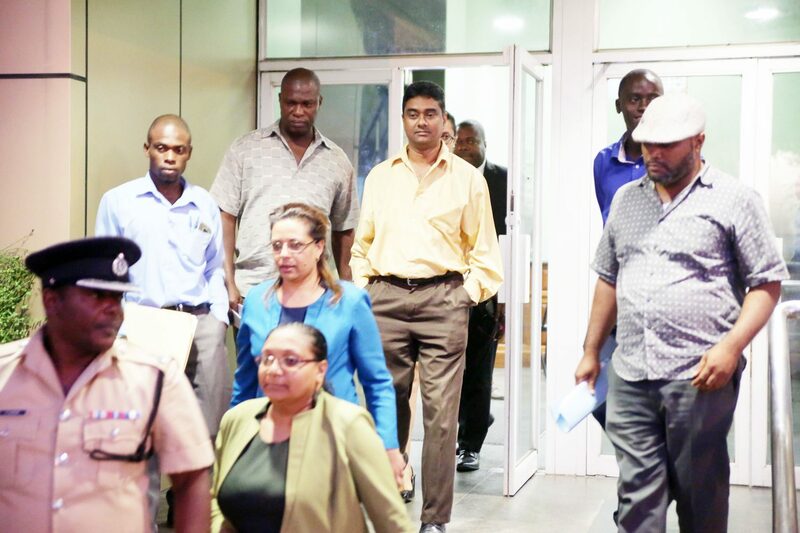 On December 20th last, Justice of Appeal Rishi Persaud ordered that Arjoon be paid pension to the tune of $59,033,000. 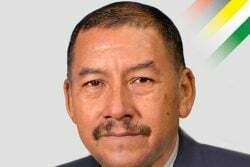 This sum was a part of the more than $79 million earlier awarded to Arjoon by High Court judge Brassington Reynolds, who ruled that he was “wrongfully dismissed” and entitled to be compensated accordingly for severance benefits, pension and loss of earnings. Following the court’s computation from estimates submitted by attorneys on both sides, Justice Reynolds in July of last year awarded a total of $79,282,801 to Arjoon. 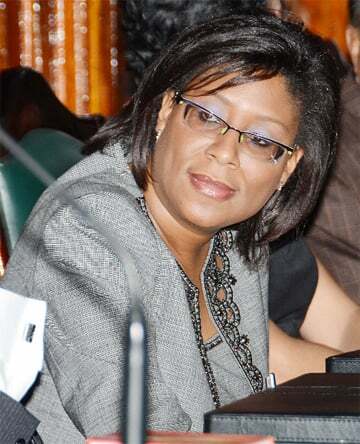 Justice Persaud, however, stayed the remaining $20,249,801 that was awarded to the sacked manager for severance. In its appeal of Justice Reynolds’ ruling, the NBS had said that it would honour whatever final judgment was awarded to Arjoon. 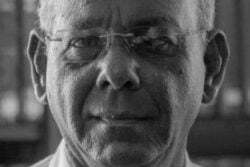 The bank, however, did an about-face on that undertaking when it filed its newest challenge to the Full Bench of the Court of Appeal, arguing, among other things, that the $59,033,000 awarded by Justice Persaud was not due now to Arjoon for pension, even on the premise that he is entitled to it for his service to the bank. 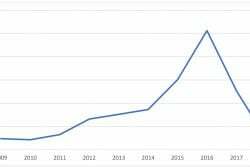 According to the financial institution, the High Court judgment does not include this figure. 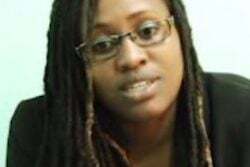 It argues that in the absence of Justice Reynolds’ July, 2017 judgment, which is yet to be made available, the basis for and accuracy of the pension figure is not available for its examination and critique. The bank holds further that Arjoon is fully responsible for the termination of his services and partly for the more than $70 million it has lost, including legal expenses for a counterclaim it made. 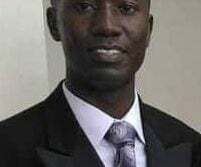 In his judgment, Justice Reynolds had said that the court found no evidence to substantiate NBS’s claims that Arjoon committed gross or serious misconduct, warranting his dismissal. The judge had said that it showed no established rules, standards or procedures which Arjoon was guilty of breaching. On June 12th, 2007, Arjoon and two other managers, Kent Vincent, Operations Manager, and Kissoon Baldeo, Assistant Mortgage Manager, had their services terminated after $69 million was discovered missing from the account of Bibi Khan. Arjoon was interdicted from duty before being dismissed. The trio, along with several other employees of the bank, were charged in the matter but they were later freed after Khan repeatedly failed to attend court hearings. After the charge against him was thrown out, Arjoon subsequently filed the lawsuit against the Society, for wrongful dismissal. 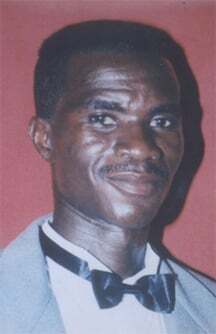 Late Ombudsman Justice Winston Moore had concluded that the three managers suffered a “grave injustice” as he found that there was insufficient evidence to suggest that the trio was guilty, let alone to successfully prosecute them.